PAGE TO PAGE presents an exciting and varied survey from the Review's illustrious history. The Seattle Review has included interviews with some of America's best writers for over a decade, and a wonderful introduction by author, Brenda Peterson. This collection features sixteen interviews with excerpts of literary works and an assortment of the writers' personal photographs. 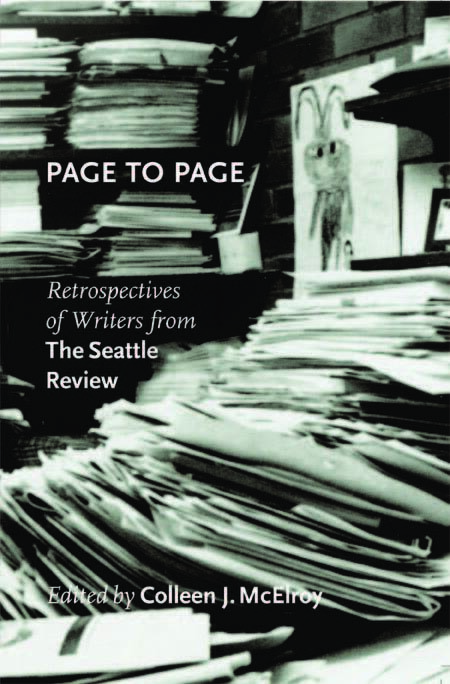 Edited by Colleen J. McElroy, who has shepherded The Seattle Review for almost two decades, PAGE TO PAGE offers a rare glimpse into the lives and craft of celebrated writers such as Rick Bass, Marilyn Chin, Richard Hugo, Carolyn Kizer, Sonia Sanchez, David Wagoner, Yusef Komunyakaa, and many more. Interviewed during the making of the film, "Wilde," actor, Stephen Frye noted that the most difficult task of portraying the writer, Oscar Wilde, was that of writing. "There's not much to show when a writer is writing. Just the sitting down and silence of it all." And yet, we, as readers, are fascinated with what goes on between the pages, how the life of the writer acts upon and is acted upon by the writing. Every writer can recall the blunt, sometimes painfully obvious questions volleyed from the audience during a Q-and-A: Do you write every day, every morning, all day? Do you use a pen, a pencil, a computer? Who reads your work before you send it to the publisher? What do you do to get started? They are questions audiences, seemingly, never tire of asking, and all of them set to unhinge the mystery: How different is the writer's life?